Often we fail to visit the history sites in our own back yard. I lived in Lancaster, Pennsylvania for twenty-five years or so and never made it to the oldest house in Lancaster County, the Hans Herr house. I rectified that this past week and was pleasantly surprised by this gem. The deceptively large sandstone house sits in the lush countryside about ten miles south of Lancaster. The Herr family was among the first group of settlers to the area. They immigrated from the German-speaking part of Switzerland and were Mennonites seeking religious freedom. Originally headed for New Bern, North Carolina, they changed their minds when they were offered land in William Penn’s colony. They traveled into the Pennsylvania frontier, 2-3 days west of Philadelphia and settled in the verdant rolling hills that looked similar to their native land (without the snow-capped mountains). Christian Herr and his family built the house in 1719 and lived there with his large family. Father Hans led Mennonite worship services in the house and it because known as the Hans Herr House. It represents typical German-style architecture with the chimney at the center instead of the ends, a raised kitchen fireplace, and door off-center at front. The small windows provide energy efficience. The steep steps in the kitchen lead down to a root cellar, which could serve as a fortress against Indian attacks. The local Indians, however, were friendly. A stairway up led to a spacious second floor room where the children slept, boys on one side, girls on the other. Our guide explained the detailed process of making oak shingles and we examined the tools that made them. I learned a lot during my visit, about a variety of topics, from German architecture, to the importance of using rye straw in items like matresses because pests are not attracted to its bitter taste. I also learned that supposedly the Catholics settling Maryland to the south were apt to encroach on Penn’s lands and the pacifist Mennonites were hesitant to stop them. Our guide said that Penn solved the problem by encouraging Presbyterians to settle a narrow band of land between the groups to serve as a buffer and to this day a string of historic Presbyterian meeting houses stand along the Pennsylvania – Maryland border. Apparently Presbyterians will fight back. My visit went beyond curiosity since part of my family heritage, so I’m told, goes back to Hans Herr. 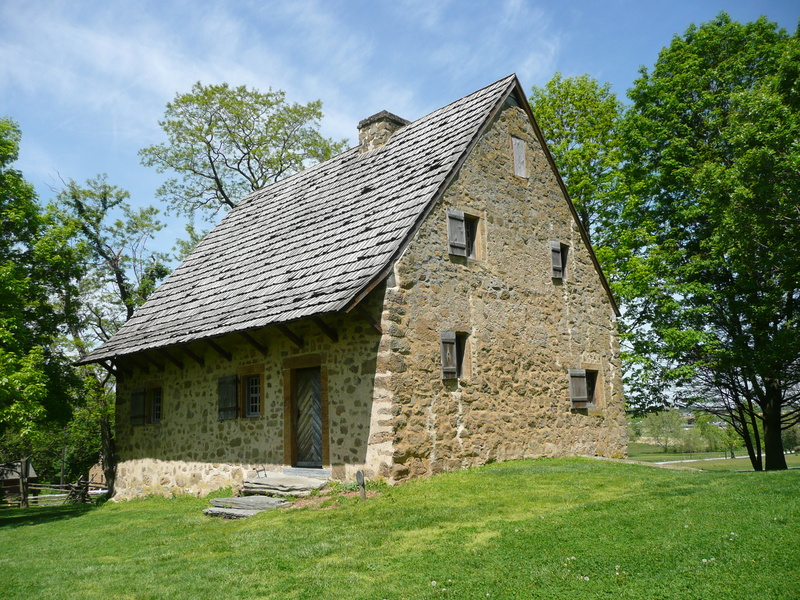 Yet for anyone, a visit to the Hans Herr House is a great way to start an exploration of the rich German/Swiss heritage of Pennsylvania. The idyllic setting among orchards (Herr was an orchardist) evokes a tranquility and simplicity that gets lost in the fast paced world we inhabit. Have you visited this place? Tell us about your visit. This entry was posted in 18th century, house, religion and tagged PA. Bookmark the permalink. I ran across this blog post while looking for any info I can find on the Hans Herr family. I recently found out that I am a descendant, and will be visiting the area in Oct.